We have an awesome new sponsor, Top Dog Dies, for the Curtain Call Inspiration Challenge: Birthday Bash! The designers received some fabulous Tog Dog Dies to work with for this challenge...such a quality product! The LEAD of this challenge will receive some Top Dog Dies of their choice! 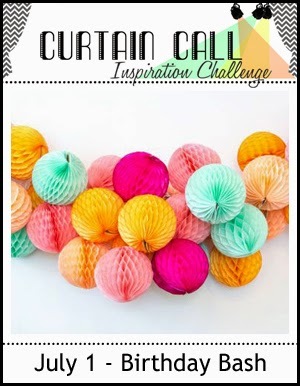 Happy Tuesday and welcome to the newest Curtain Call Challenge, Balloon Bash! I die cut some shapes from the Top Dog's Sew Much Fun Die set. The dress form was die cut once in kraft and once in the floral patterned paper. Then the dress was cut from the floral paper and I freehand cut a neckline. The dress was adhered to the kraft stand. Twine was wrapped around the spool and the needle was inserted. The scene was then adhered to an embossed background. This card is going to my Mom for her birthday today, July 1st, which is also Canada Day! These dies remind me of the many hours my Mom spent sewing when I was a girl! 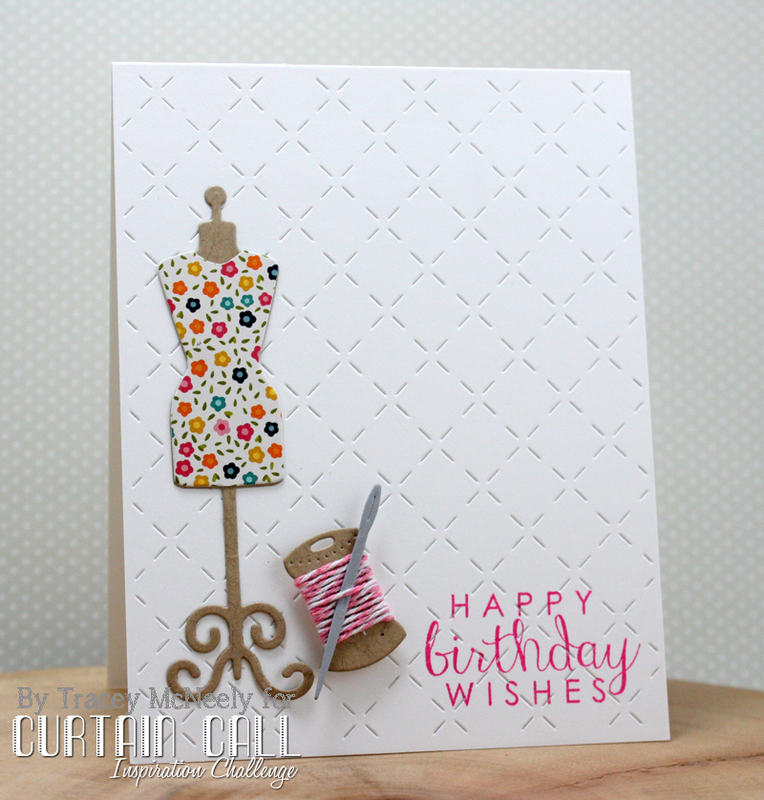 Stop by the Curtain Call Inspiration Challenge: Birthday Bash and play along with us! Love the die cut dress form and the addition of the twine! I love the background dies and the dress form Tracey. Love the needle stuck in the spool of twine Tracey...your mom will love this! How cute is that dress! I love all the die cut details! I also love the use of spool and twines!! DARLING design! 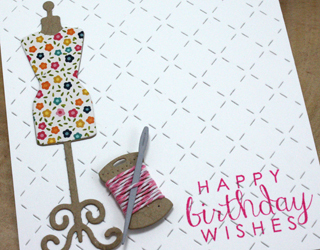 Sweet birthday card--and so perfect for someone who sews. Your mom will love it! What a FAB card! Love the background and so many cute details. Love it :) Happy Canada Day!! Awww she is going to LOVE this Tracey, super cute! I love your card so much that now I 'need' these dies!! Happy Birthday to your mom! Happy Canada Day and happy birthday to your mom. Fantastic card. I love that dress form, and the embossed background is perfect. So pretty Tracey. Love the dress form and that spool with the pink twine! The stitched background is perfect. This is perfect with Float!! I love the bright colors - you've really captured the party spirit too! The quilted look background goes perfect with the dies you selected. Lovely feminine card Tracey!! OH wow...I love this card! That dress form and the quilted background, fabulous card Tracey! super fabulous, I love the DP for the dress and the stitched backdrop on white is the perfect compliment! Fabulous card, Tracy! Love the stitched background! Happy Canada Day, sorry late. I have a sister with the same birthday. Love the new dies and fun card you made for your mom. Sew fun! LOVE that embossed background, and the floral dress adds just the right amount of whimsy! Fabulous card - and I know your mom loved it! I'd wear a dress like the one you've created in a second! So pretty! The needle in the thread: such a charming special touch, as is the background!